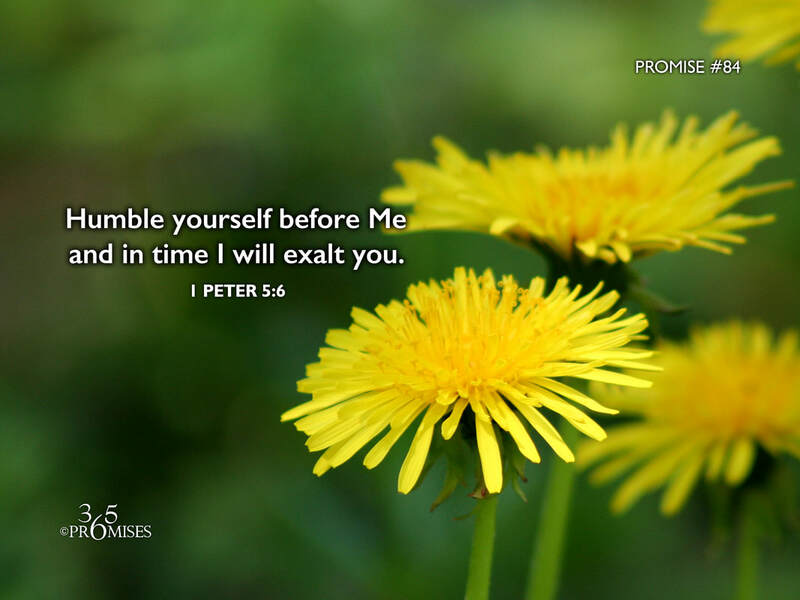 Today's promise simply encourages us to walk in humility. God loves it when we embrace humility because when we are truly humble, we are just like Him! Jesus told us that the greatest in the kingdom is the servant of all (Matthew 23:11). Who is the greatest in the kingdom but our Father? That means that He carries within Himself the heart of a servant. When we choose to humble ourselves, He is so delighted that He is the One who lifts us up! We don't have to fight and strive for our position in the kingdom because our Father will exalt us at just the right time. I remember a few years back I went to a very large church meeting and I felt the Lord directed me to sit on the very last row at the back of the church. He told me to literally take the lowest seat in the building, so I did. Just before the meeting began, a man came up to my wife and I and ushered us to the very front of the building and we got the best seats in the house! The Lord then reminded me of His encouragement for us to take the lowest seat (Luke 14:8-10) so that we can then be re-assigned to a better seat if the opportunity arises. Our Papa loves it when we embrace true humility (not false humility) and trust Him to exalt us in due time. My prayer for each one of us today is that we would see the incredible benefits of walking with a humble heart in our Father's kingdom.